This object is an aspersorium, a vessel for holding holy water. It is made with ice glass, a decorative effect that causes the surface of the glass to resemble cracked ice. 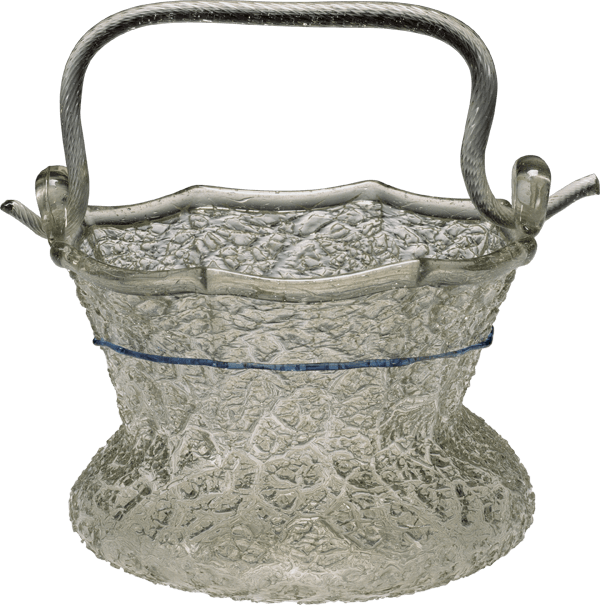 The aspersorium has a handle attached by two loops, an edge wrap, and a body wrap. 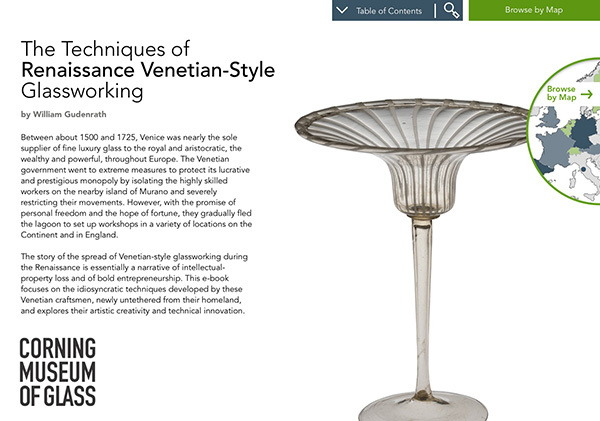 The vessel wall is rather thick, compared with other Venetian glass objects, so a double gather is made. The block is used to shape the glass, and a bubble is blown in. The tip is marvered. The end is left thick—it’s essential that the glass be thickest on the tip. The ice-glass effect is created by repeatedly dipping the soft glass into water, then reheating it and blowing while reheating. This process is repeated up to 15 or 20 times. During the reheating and blowing, the cracks become fissures. Ultimately the bubble has to be separated from the blowpipe, and this is done with a constriction or neck. The lower vessel is given its shape. The vessel is transferred to the punty (or pontil). Reheats are kept to a minimum and kept brief to not soften the glass too much and damage the ice-glass pattern. 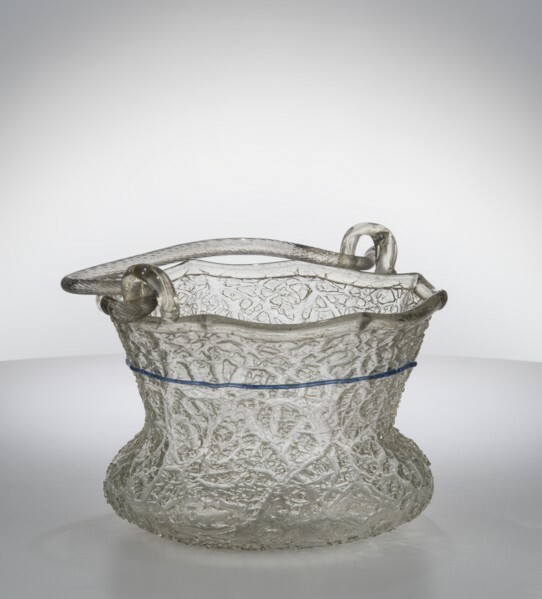 A decorative thread of blue glass is added near the top. A thick, clear lip wrap is added. The glass is reheated and tooled to create the final shape. Next, the octagonal shape will be given with the fin mold. The glass is softened and lowered onto the fin mold. This creates the octagonal rim. Loops are made to receive the handle. Glass is added. Excess glass is cast off, and the loop is tooled to give it its final shape. The second attachment point is made and the excess glass cast off, leaving a thin, cast-off trail. The vessel is placed upright in an annealing oven, and the handle is made. The handle begins as a gather of glass lowered into a dip mold (or optic mold). The handle is solid; there is no bubble. The glass is elongated, held upward, then downward to attempt to make the gather the same thickness. Eventually a soft cane is created. The cane is cut free of the gathering iron and puntied at its center. The ends of the cane are softened, and the bending begins to create the handle. The tips are heated and bent outward. The entire handle is softened, put in place, and then expanded to fully fit the aspersorium. The punty (or pontil) is broken free of the handle.